NuMedica B-Replete provides a therapeutic dose of B-complex vitamins along with other nutrients to support major aspects of your health and your body's various systems. By delivering your body the entire spectrum of B vitamins and other essential vitamins and minerals, you ensure that your nutrition is complemented with a powerful and comprehensive B-vitamin supplement that can enhance your overall health. 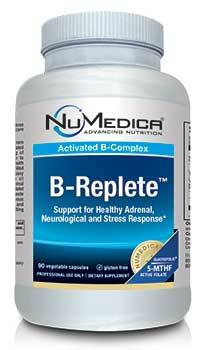 NuMedica B-Replete is designed to provide you with comprehensive B-vitamin support. B vitamins are associated with a wide array of health benefits such as reduced risk for cardiovascular disease and improved response to stress. There is also evidence that B vitamins may reduce some symptoms associated with anxiety and depression and may support your neurological functions. Some people have reported improved memory while taking B-vitamin supplements and reduced symptoms of PMS. 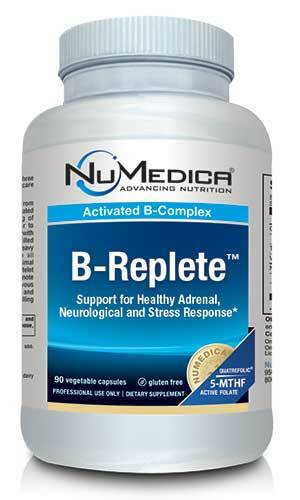 Some B vitamins contained in NuMedica B-Replete's powerful formula boost your body's ability to burn fat as energy. Consequently, when you take NuMedica B-Replete, you may find that your metabolism process is greatly improved. Many people do not get all of the B-vitamin support they need for optimum health from their diet. According to the USDA, many people have deficiencies in vitamin B12, B6, and folic acid, which are all essential nutrients for good health. Even if your diet is rich in dark green vegetables and animal protein sources where B vitamins are found, you might need additional B vitamins found in a supplement, especially if you are under stress. In addition to its rich B-vitamin content, NuMedica B-Replete also contains Benfotiamine, PABA and vitamin C, other nutrients that complement the role B vitamins play in your system while providing characteristic benefits of their own. For example, vitamin C enhances the immune system's ability to fight off sickness and disease. B-Replete - 90c 1 Capsule 90 Take one capsule 1-2 times daily or as directed by your healthcare practitioner. B-Replete - 180c 1 Capsule 180 Take one capsule 1-2 times daily or as directed by your healthcare practitioner.